What could be more festive for spring than bright and cheery Easter baskets filled with plenty of goodies? 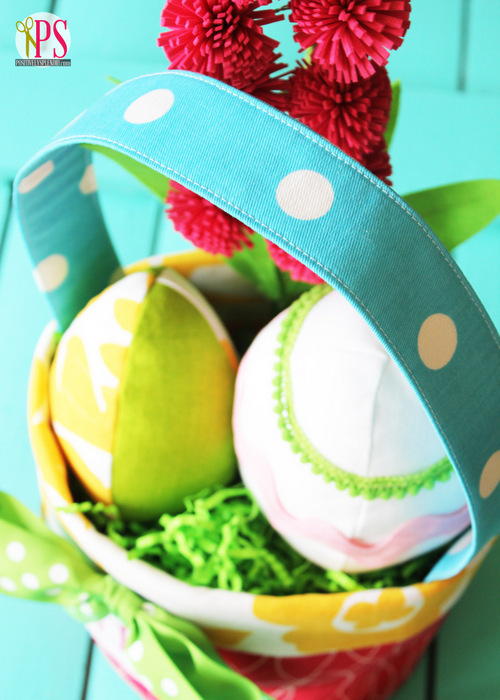 Today I’m sharing a deceptively simple pattern for fabric Easter baskets that requires minimal supplies and only very basic sewing skills. When you see how truly easy it is to make and Easter basket with this pattern, you’ll want to make one for everyone you know! 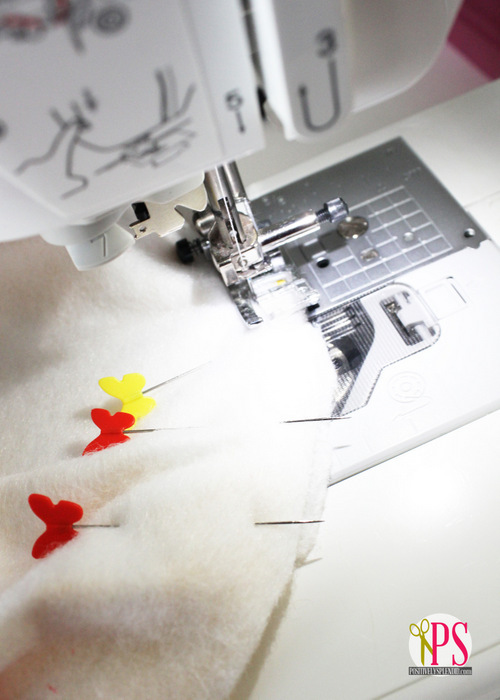 Basic sewing supplies: machine, shears, pins, iron, etc. Note: All seam allowances are 1/4″ unless otherwise specified. To start, download and print the basket bottom pattern piece (linked above). Fuse the Decor Bond pieces to the wrong side of their corresponding outer fabric pieces. 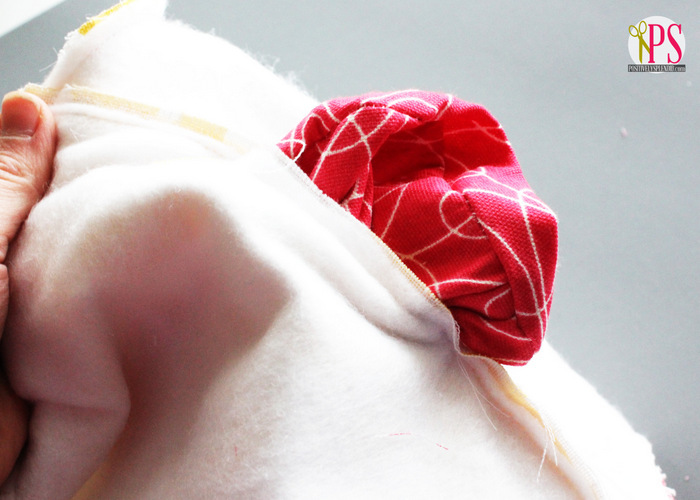 Fuse the fusible fleece pieces to the wrong side of their corresponding lining pieces. Fuse the 1.5 x 22″ strip of Decor Bond to the strap piece, aligning one of the 22″ edges of the Decor Bond with one of the 22″ edges of the strap piece. (Consult each product’s packaging for specific instructions for how to do so.) Set all pieces aside except for the lining/fleece piece. 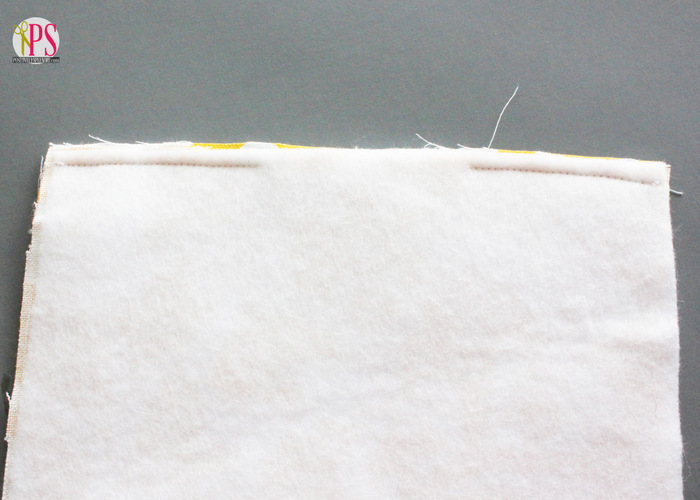 Fold the lining/fleece piece in half, right sides facing, matching up the 9.5″ sides. Pin. 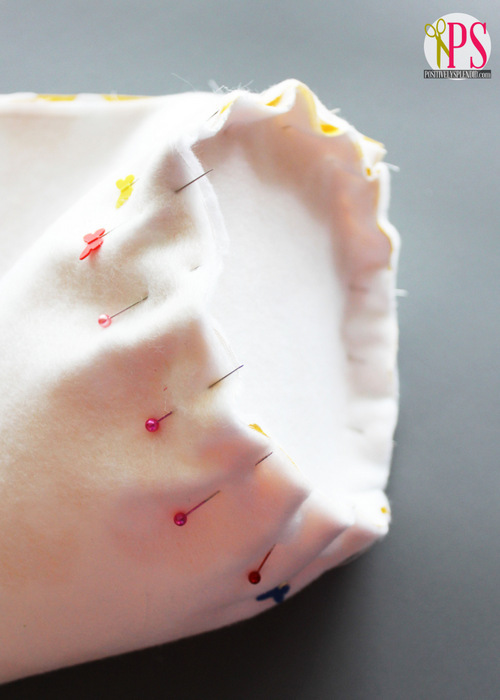 Stitch along the pinned edge, leaving a 3″ opening at the center, as shown. 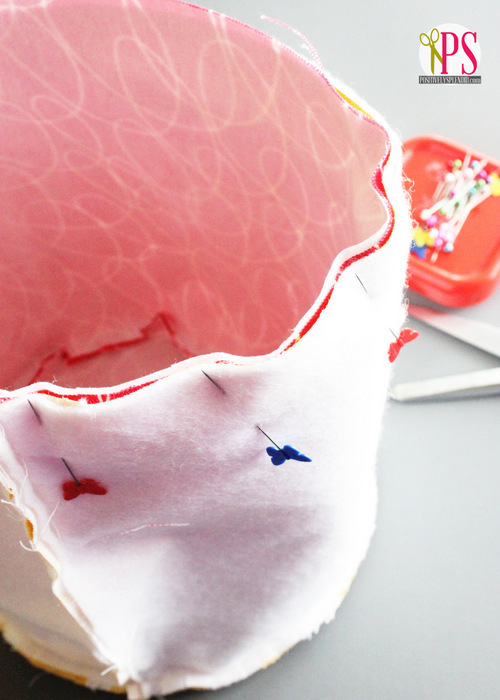 Open up the stitched piece so that it forms a tube. Pin the round bottom lining piece along the bottom raw edge of the tube, as shown, making sure the right sides of each piece are facing. 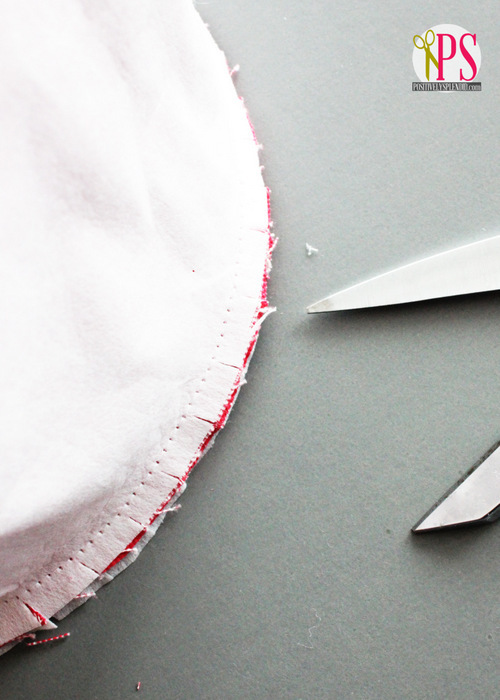 Carefully make snips around the perimeter of the stitched edge, making sure not to cut through the stitches themselves. 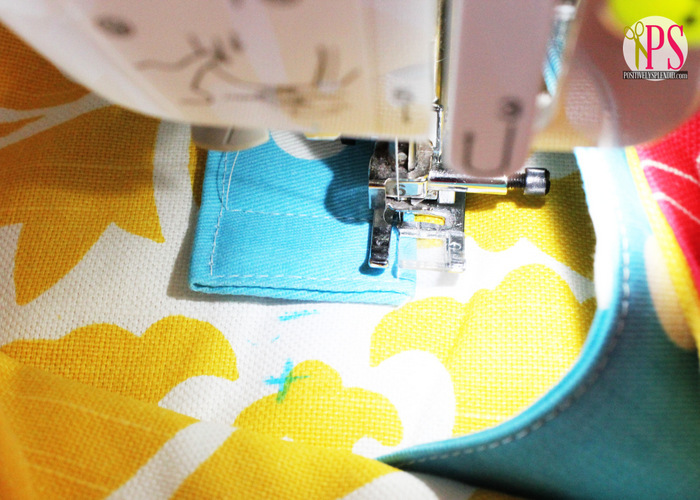 Repeat the preceding steps with the outer/Decor Bond pieces, except do not leave a 3″ opening when you sew the side seam in the first step. Stitching the bottom piece to the sides is a bit challenging because of the weight of the Decor Bond, but I assure you it can be done! Turn the outer piece right side out. Slip it down inside the lining piece so that the right sides of each piece are facing, lining up seams and the top edges. Pin. Stitch around the entire top edge. Carefully pull the outer piece through the hole in the lining piece to turn the basket right-side out. Tuck the lining down into the basket; press. Turn the top edge of the basket down by 1-3/4 to 2″ to form a cuff; press. Pinch the sides of the basket so that the back seam is centered to either side of the points side points. Mark the side points with a washable ink marker. Set the basket aside. Fold the short ends of the strap piece under by 1/4″ press. 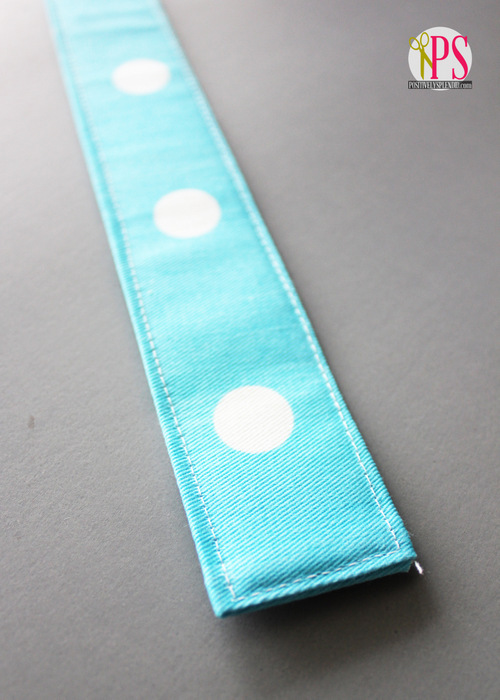 Fold the strap piece in half lengthwise; press. Fold each of the outer long edges in toward the center crease; press. 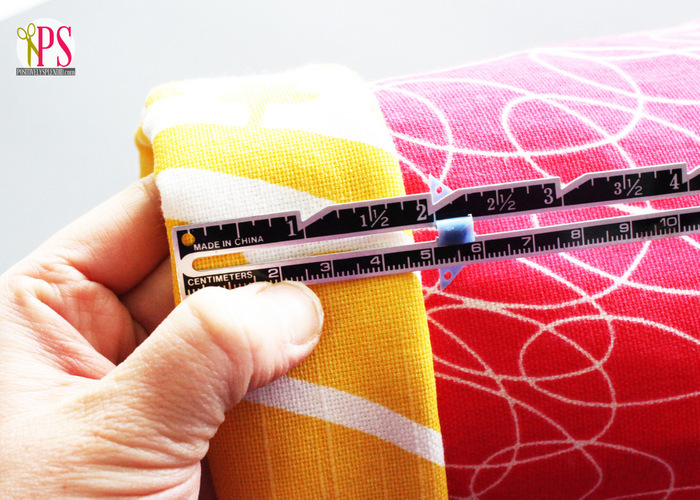 Now, fold everything in half, concealing the long raw edges in the center of the piece, to form a 1.5″ wide strip. Press. Edgestitch around all four sides of the strap piece. Unfold the cuff of the basket. Making sure the strap ends are centered at the side marks you made earlier, pin each end of the the strap to the inside of the basket so each extends 3″ from the top edge. 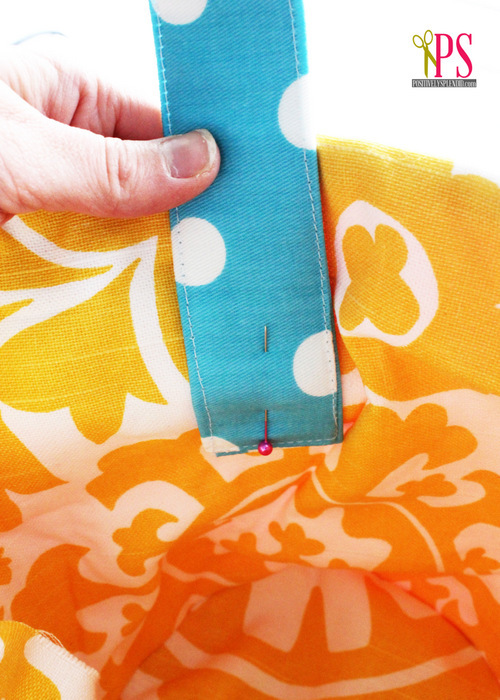 Secure the strap ends to the inside of the basket by stitching a small rectangle, as shown. Refold the cuff, and then embellish the front of the cuff with a bow, if desired. I also opted to add a cute handmade monogram patch to my basket, made using the same basic method I used in my fabric gift tag tutorial. I made a 3-inch, single-sided white patch that I cut out with pinking shears and then embellished with an adhesive vinyl monogram cut with my CAMEO. If you love the look of monograms but don’t have a die cutter at your disposal, you could also use iron-on embroidered letter patches or paint and a monogram stencil. There are many different options! Note: I adhered the bow and monogram patch to my basket with hot glue, but you can sew them on if you prefer. Your Easter basket is complete! 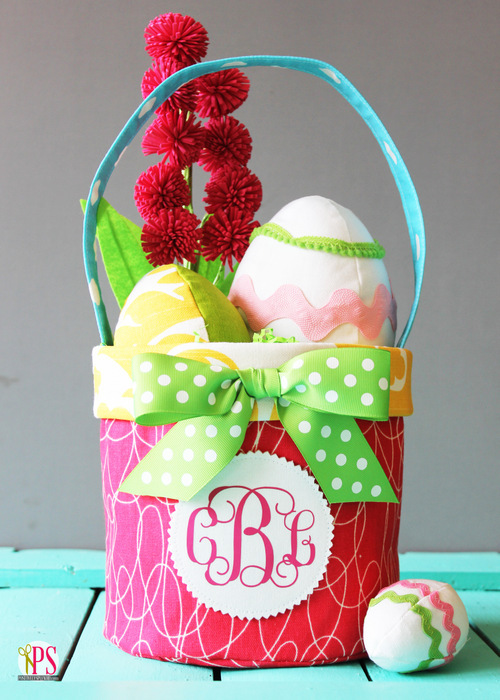 These baskets are the perfect size for filling with plenty of goodies, like my fabric Easter eggs! By using any number of different fabrics and trims, you can modify this pattern countless ways to make it equally appropriate for boys and girls of all ages. If you prefer, you could also put a cute applique of some sort on the front instead of the monogram patch. They sky is the limit! 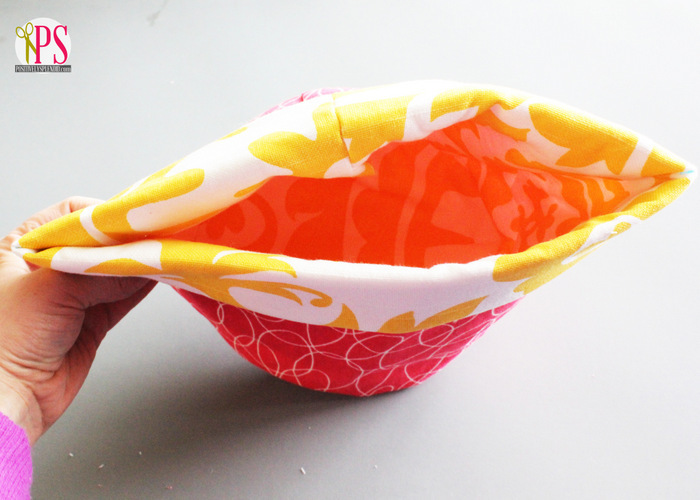 The long handle is perfect for toting the basket during a lively egg hunt, too. Note: To add extra body and stiffness to the strap piece, I recommend spraying the strap heavily with spray starch and then hanging the basket from a doorknob or other object to dry overnight. 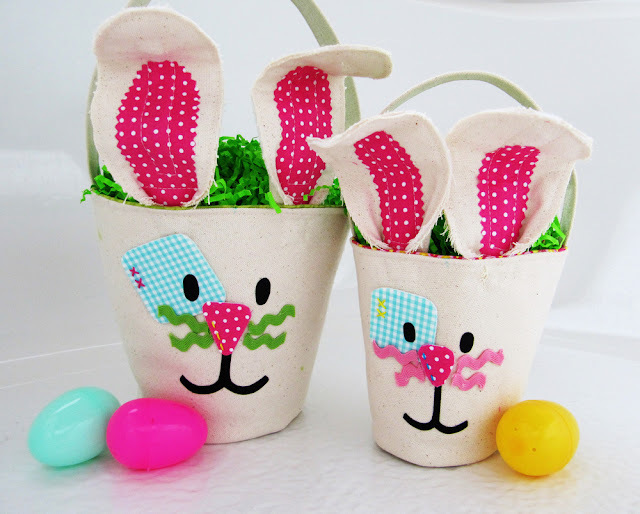 If you are on the hunt for another fun Easter basket idea, also check out my Canvas Bunny Easter Buckets! My Easter Project Gallery is full of lots of other great Easter ideas, too! This is adorable and thrifty! 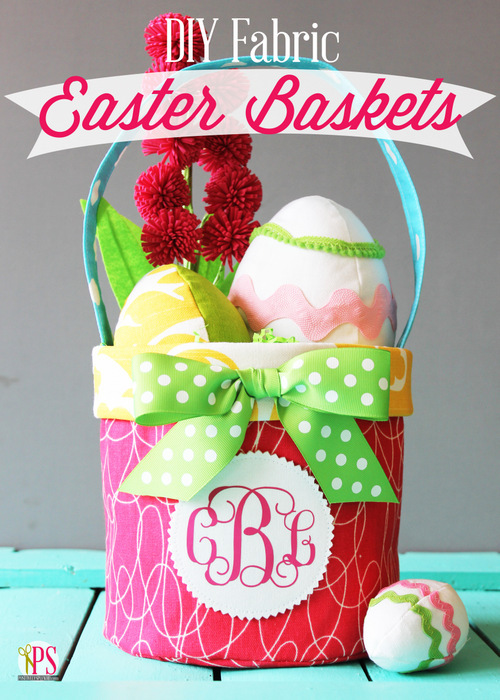 Easy way to customize everyones Easter baskets as well! ohmygosh, I just absolutely love love looove those baskets! So colorful, so super duper cute! Many blessings and thanks for such a great, happy and colorful post! This is sooooo darling Amy! 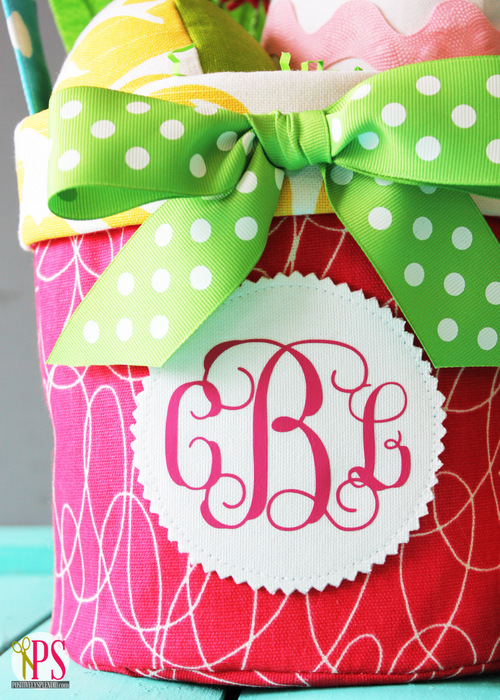 I love how colorful it is and that monogram is perfect! This is the cutest Easter Basket! I love the colors and patterns…so bright and pretty! The monogram is the pefect touch, too! Oh my!!! So much fun and I love the colors you’ve put together! I need freshen up my sewing skillz! Super cute!!! Love it!!! Thanks for the tutorial!! how big is the basket when finished? 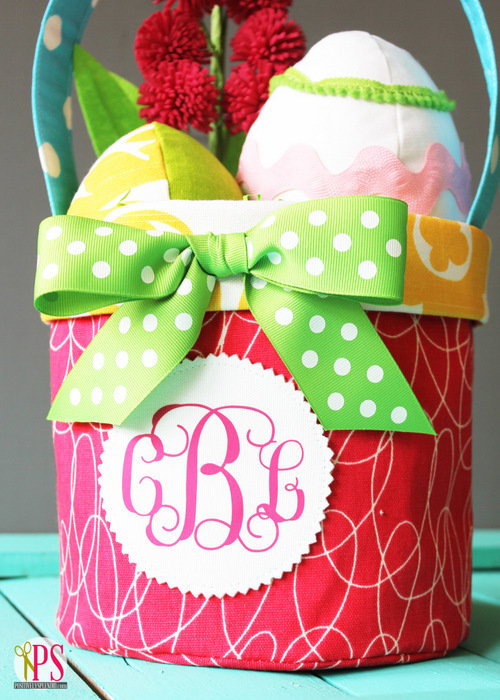 Is there anyway to print all of your directions for the Fabric Easter Baskets – they are adorable.